I am not a turkey stuffer, however, this is a great stuffing mix for any bird. 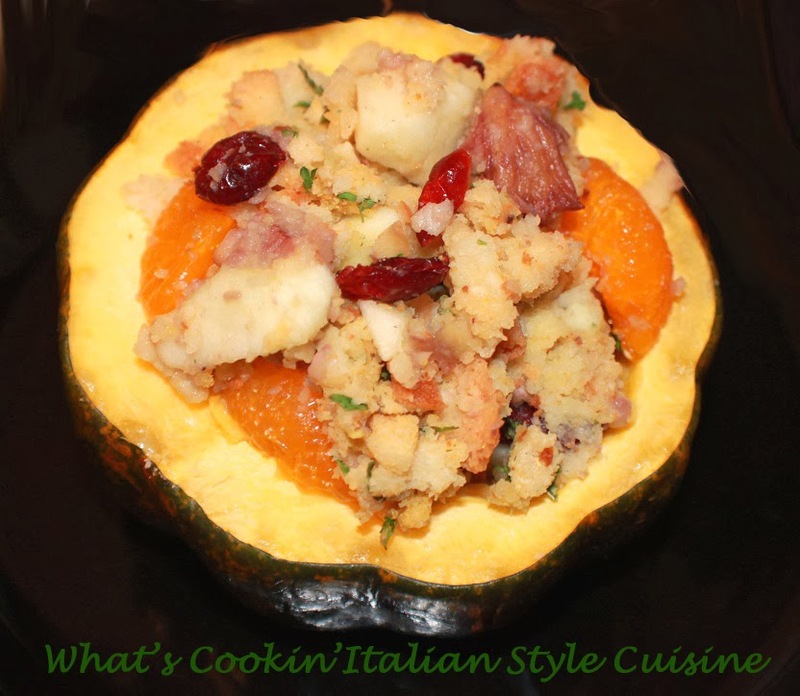 We just love it as a side dish, the flavors are fabulous and you can never go wrong with this Chestnut Sausage Stuffing. The fruit and seasonings all compliment each other. A great addition for any Holiday table. First you need to bake the acorn squash sliced in half. Remove the seeds and clean. Bake in a 400 degree oven on a cookie sheet until soft. Make as many as you have guest size. You will be using these as a bowl. 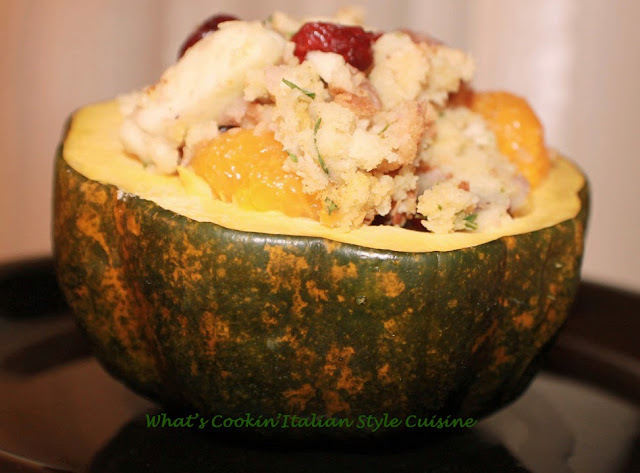 If you can't find acorn squash any squash that serves as a deep bowl is fine. like butternut etc. Just bake it until soft removing all seeds inside first. In a large fry pan sauté sausage if using with 1 tablespoon olive oil, until no pink remains. Add the garlic and onion if using until fragrant around 2 minutes. Remove from heat drain any oil. In a bowl add the bread cubes, then mix the fruits, cranberries, spices and seasonings in with the cubes, sauce, broth then add the drained sausage with the garlic mixture. Mix all together and either place in a buttered baking dish, or fill each cooked acorn squash for the number of guests you have. If you think it's too dry when reheating add more chicken broth. Bake at 350 degree hot oven a few minutes just until warmed.